Coinciding with the publication of a new popular book, the Yorkshire Museum is hosting a major exhibition of artefacts and interpretations of the UK’s most famous and finds-rich Mesolithic landscape at Star Carr in Yorkshire, England. The exhibition is open from 24 May 2013 for a year and is widely covered in the archaeological and regional media. Bringing together the artefacts previously scattered across many museums and repositories since Clark’s excavations in the 1950s, the exhibition aims to present the most recent investigations in context—the landscape, the re-colonisation of Britain (or expansion of the late Glacial “epi-Palaeolithic” long-blade communities such as those at Creswell Crags in Derbyshire), the environmental transformations, human beliefs, behaviours, mobility and the material culture that give hints to a complex hunter-gatherer-fisher society. These were modern humans, just like us. On Thu 30 May 8pm there will also be a UK television Time Team special on Star Carr (Channel 4). 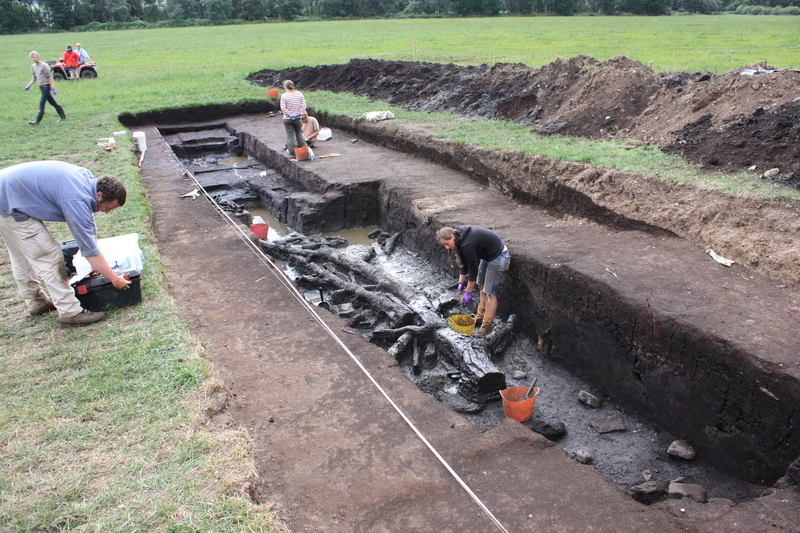 Current archaeological research and interventions in the eastern Vale of Pickering, recently under the leadership of York and Manchester Universities, acknowledge the very short remaining lifespan of previously waterlogged organic remains. What were hard, crisp and tangible testaments to Mesolithic lifestyles—barbed points, supposed “head-dresses”, the working of antler, bone and wood, shale beads, birch rolls and more—are now feeble ghosts of their former selves, if they survive at all in the peat. Drainage and agricultural activities have desiccated and acidified the waterlogged matrix: it often has the pH of stomach acid today. 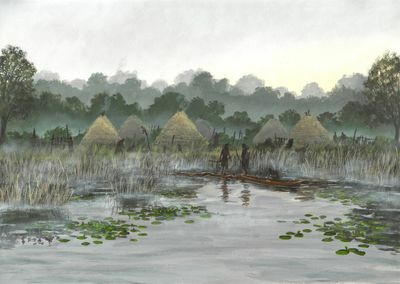 On the other hand, fieldwork since the 1980s and more recently has proven that Star Carr and the Early Mesolithic lakeside activity areas were far more extensive than previously thought, at around 9000 cal BC. Hoof prints from undomesticated horses have been discovered on Flixton Island—perhaps their last stand? Mobility across a forested, watery landscape becomes apparent by looking at the lithic (flint) distribution and operational chains, from sourcing the raw material, knapping reduction strategies, caching-curation, re-usage and discard behaviours. There’s also now evidence for structures* of some sort and repeated returns to the area over generations. Unlike corollaries in southern Scandinavia, linked by Doggerland across what is now the North Sea, only human burials remain entirely elusive at Star Carr—for now. *Conneller, C. et al. 2012. 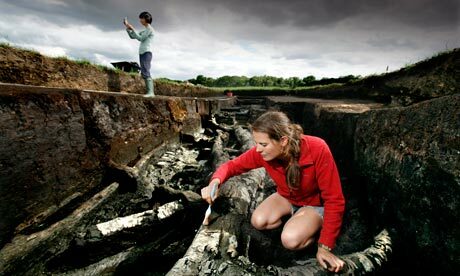 Substantial settlement in the European Early Mesolithic: new research at Star Carr. ANTIQUITY 86 (334), 1004-1020. If not left to the elements, perhaps the dead were deposited in the lake, or on islands now denuded, or far “offshore”? Watery places retained significance throughout the prehistoric period—were the many barbed points deposited rather than discarded? Do we even know what we are looking for? Within a few thousand years the North Sea inundation separated Britain from Europe, and a rather different material culture evolved—the so called Late Mesolithic. One can argue for evolution or revolution, but much more research and dating is needed from the post glacial into the Neolithic where communities with very different life-strategies may have co-existed (northern European evidence hints at this). The exhibition is a once-in-a-generation chance to see the most comprehensive and intimate story about our earliest post-glacial ancestors. People just like us, and yet so different. Or perhaps not? How many of our “instinctive” behaviours today bear testament to our hunter-gatherer-fisher past? Maybe we just live longer and refined the BBQ experience? I promise a review when I have seen it. Also coinciding with the exhibition, the Archaeology Data Service (ADS) in York have published the online Star Carr Archive, funded by English Heritage, “with the primary aims of locating and cataloguing as many of the finds and excavation records as possible in order to enable further research”. Inevitably over the last 60 years, and more so with the separation of many of the written records, artefacts and ecofacts, some materials have been lost or misplaced. This initiative identifies, records and consolidates what remains into a single report. This entry was posted in British archaeology, Hunter-gatherer-fisher, Lithic analysis, Mesolithic, Microburin miscellaneous and tagged Creswell Crags, Mesolithic, Star Carr, University of York, Vale of Pickering, Yorkshire Museum by Spencer Carter. Bookmark the permalink.